Not so much today, but way back in the day, people had the tendency to write their name on their games. You encounter this phenomenon quite often when rummaging through piles of old games, and it can turn an otherwise flawless game into a scribbled up disaster. Turns out, however, that permanent marker might not be so permanent after all. It's almost painful to look at. Such disrespect! 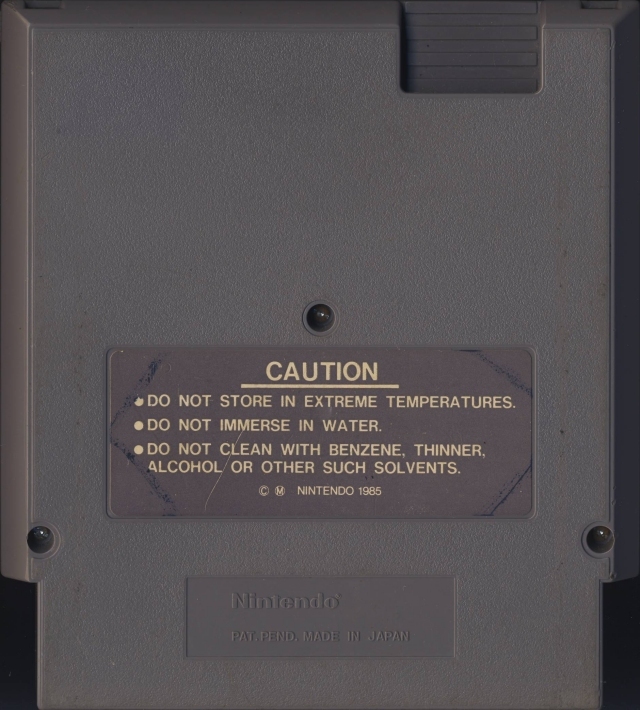 Right away, for the record, I am going to say that the thing that irritates me more than anything when it comes to buying old, used games is when kids write their name on their carts in black permanent marker. 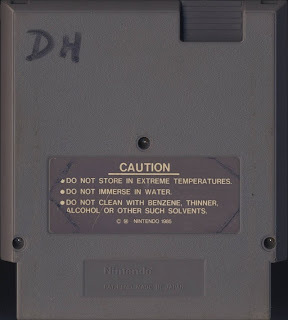 More than torn labels, more than physical defects (although bite marks are rapidly climbing the list of annoyances)... writing all over games is the thing that really bothers me. It is intentional defacement. I encounter this phenomenon a lot "in the wild." It's not just kids that do this, though. Rental stores are also very guilty this. In addition to plastering their games with stickers that tell where the game is from, some of them also like to write cataloging codes on them with permanent marker. Several NES games I bought from a particular rental store all have these numbers scrawled on them somewhere. So let's take a look at the image of Metroid to the right. Nasty, isn't it? This was a rental copy of Metroid a friend gave me in a bulk of games that he didn't want. 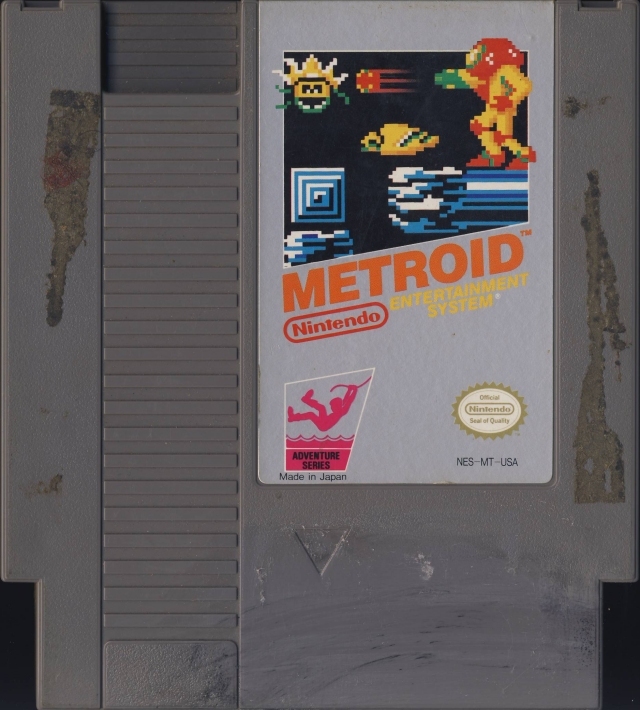 It's really no surprise why he wouldn't want this disgusting copy of Metroid in his collection. At the bottom of the cart you can see someone scribbled something out in permanent marker. I can't make out anything it says, but more than likely it was the name of the rental store or the name of the first kid who bought it from said rental store and then decided to mark it with his name. Because, you know, you have to write your name on your games so you can tell which is yours. Even when they look as trashed as this one. So since I was given a bag of NES games in less than spectacular condition, I decided to try some different methods I read online on how to remove permanent marker from games. Because if there is a way to get kid's names, catalogue codes, and other weirdness off of carts, I want to know how to do it. Two methods I read caught my interest, so I picked up the supplies to test both. The first method I read said that nail polish remover would remove permanent marker. This seemed like a plausible theory to me. I picked up a bottle of Onyx Professional nail polish remover and dabbed a bit onto a paper towel. The moment I swiped the towel across the game, I knew I had just ruined the game. It removed the permanent marker, but it also took some of the plastic off with it. The nail polish remover instantly left a slick, smooth spot where I rubbed the paper towel across it, very similar to what a Mr. Clean Magic Eraser will do when you scrub in the same spot. Don't use Mr. Clean Magic Erasers to take marker off of carts, by the way. Just throwing that info out there. That's one I tried years ago and ended up ruining a game then, too. So now we move on to the second method, which I wondered if I should even attempt because it seemed so strange. The second method I read said that if you rub a dry erase marker onto the affected area and then wipe it off, it will take the permanent marker off with it. Apparently something in dry erase markers will dissolve the ink left behind from a permanent marker. Good thing I have a bunch of dirty duplicate games I can experiment on, because I'm getting ready to become a hypocrite and write on some games. Speculation on what "DH" stands for. Go! I used black Expo chisel tip dry erase markers for this experiment. The first thing I wanted to do was see how the markers would react when you wrote on a game with them, so I wrote the word "jank" across the bottom of the copy of Metroid I ruined and then easily wiped it off with a paper towel. There were no problems, and you couldn't tell I had written anything on it at all. You could tell, however, that someone had wiped nail polish remover across it. To the right is a copy of Section Z that a kid apparently wrote his initials on. He must have thought that this copy of Section Z would be his forever, but that was not the case. Now it's mine, and now my game has writing on it. So the question is: Will the dry erase marker method take off permanent marker, or will it destroy the game like the nail polish method? Ooh... I can't wait. Not a trace of DH's graffiti! Wrong. I went over it a few more times with the dry erase marker to ensure I got as much of the permanent marker off as I could. In the end, almost all of the initials are gone. You can very faintly see it, but you wouldn't know it was there if you weren't looking for it. I left the ink on the caution sticker to help prove that this is the same game. Literally all I did to it was scribble a dry erase marker over the ink and wiped it off. So what have we learned? Very valuable information, as far as I'm concerned. We now know how to make permanent marker on games not so permanent. 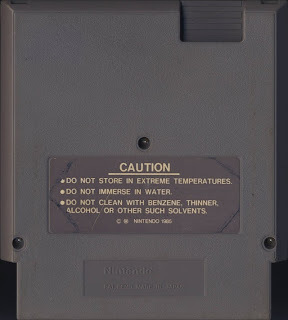 We also know not to use nail polish remover on a game unless you're trying to destroy it. We know that it is possible to restore what I once felt was unrestorable. And, most importantly, we know that I don't have to go kill crazy when some kid decides it's a good idea to tag his games with markers. I should say, however, that this method hasn't worked perfectly 100% of the time. 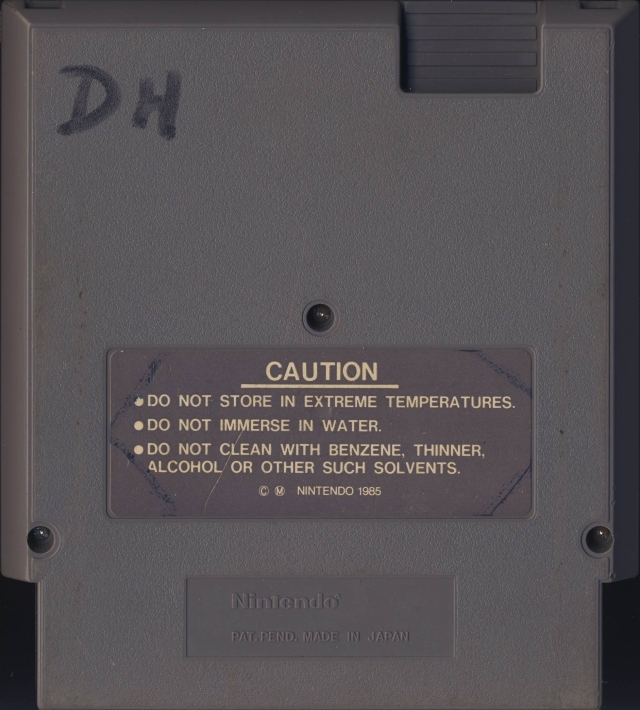 There are still games where the permanent marker is quite stubborn, and no matter how much I write over it and wipe it away, you can still see the original writing. It's still a good method, though! Now if I can just remove "Daddy's Man" from my copy of Hatris. So until next time, don't have negative thoughts. Remember your mantra. This is some terrific advice! I will try it. A rental company did that to a few games and I think some personal owners did the same.